Indiebound can help you find an independent bookstore near you. The Opposite of Spoiled is all about how, when and why to talk to kids about money, whether they are 3 years old or teenagers. Written in a warm, accessible voice, grounded in real-world experience and stories from families with a range of incomes, The Opposite of Spoiled is both a practical guidebook and a values-based philosophy. The foundation of the book is a detailed blueprint for the best ways to handle the basics: the tooth fairy, allowance, chores, charity, saving, birthdays, holidays, cell phones, checking accounts, clothing, cars, part-time jobs, and college tuition. 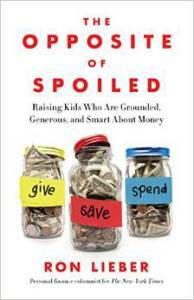 It identifies a set of traits and virtues that embody the opposite of spoiled, and shares how to embrace the topic of money to help parents raise kids who are more generous and less materialistic.